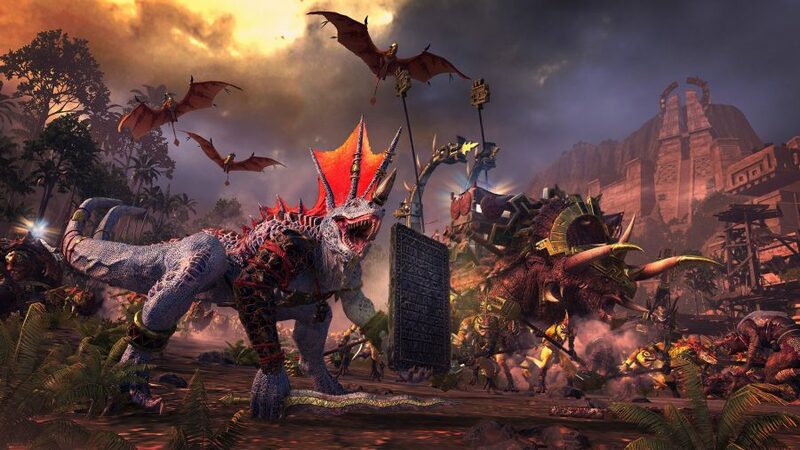 Total War: Warhammer’s smaller-scale Legendary Lord packs have always been about rivalries, but few are as thematically appropriate as The Prophet and the Warlock. The Skaven weaponsmith Ikit Claw represents science in its most negative form: amoral and recklessly experimental. The Lizardmen prophet Tehenhauin, by contrast, is an emissary of the serpent god Sotek, and represents magic and religion. Tehenhauin’s campaign in particular leans in to this rivalry. 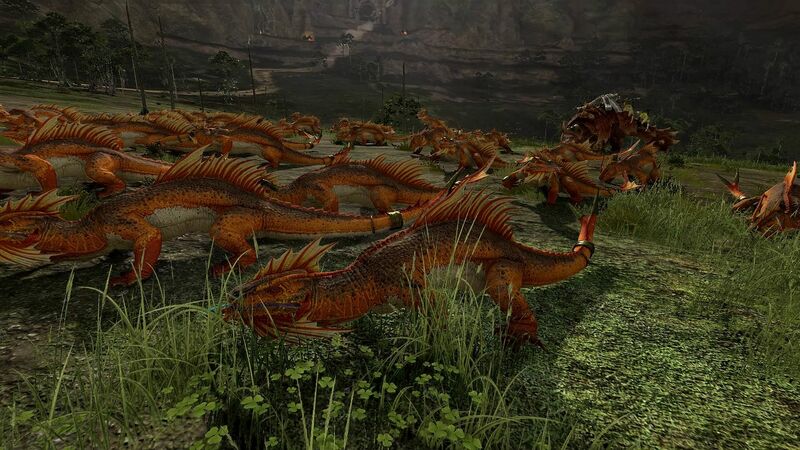 Most of this rare red-crested skink’s kin were wiped out by a Skaven plague, along with his city of Chaqua. This prompted a bitter hatred of the ratmen which Tehenhauin’s campaign mechanics reflect. His overarching goal is to manifest his god in the world, which you’ll do by carrying out the Prophecy of Sotek. The prophecy is in three stages. You progress from one to the next by owning territory and sacrificing captives to Sotek, which you can capture after winning battles – though this does undermine the other two post-battle options, making it a less interesting choice. Sacrifices are arranged in six tiers and can unlock Regiments of Renown, as well as temporary buffs or randomly-generated items. The value of all of this quickly becomes apparent. Tehenhauin’s campaign is rated ‘very hard’ for its perilous start: within eight turns, I’m besieged by two big armies from the neighbouring Skaven clan, Fester, and I’m forced to pull out a few tricks. Tehenhauin gets a hefty discount on the Rite of Sotek, so I carry that out to inflict attrition damage on the invaders and buff my army of skinks. I then perform two sacrifices to Sotek for extra leadership and armour. I wait a few turns for the attrition to bite, and win the resulting battle handily. But your starting circumstances aren’t the only reason you’ll have to confront Tehenhauin’s hated enemies. Though Skaven infest Lustria, so do the elves, and other Lizardmen can opt to beef with them instead if they wish. That’d be a mistake for Tehenhauin. As the prophecy unfolds, your conflict with the ratmen escalates in ways that I won’t spoil, but which are somewhat out of your own hands. Normally, I resent choice being removed in strategy games, but at least it’s pleasingly lore-appropriate here. Plus, it has the effect of creating new challenges: I’ve had to take allies where they are to be found, and so have built an anti-Skaven coalition of elves and lizards that spans the continent. It’s the kind of epic clash about which Warhammer books have quite literally been written, and which only emerges very late in the base game, when the race to control the Great Vortex enters its final stages. Ikit Claw’s unique trick is the Forbidden Workshop, a representation of the feverish tinkerers of his clan, Skryre, through which you can upgrade their technological weapons. I channel my teenaged ambition to join a Harley gang and invest mainly in the motorcycle-esque Doom-flayer. You can upgrade these by giving them all Vanguard deployment and +15% speed. Or by having them randomly cast Warp Lightning while in melee. You get the idea. These are not forgettable, insignificant buffs. These are mad, dangerous buffs, which can create some seriously powerful units. 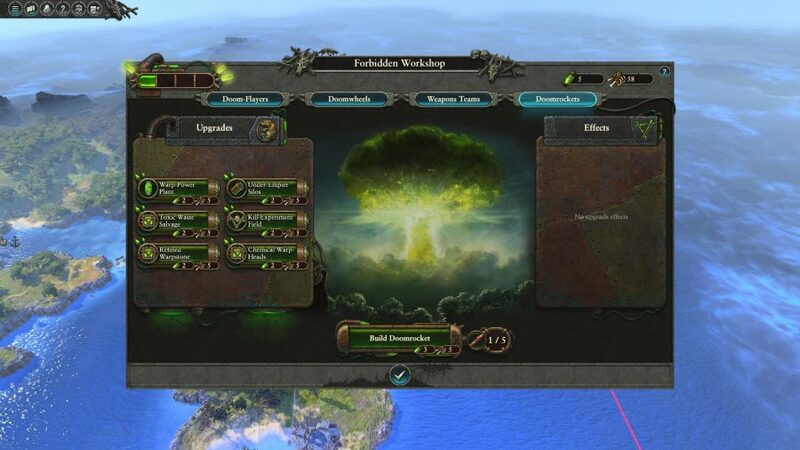 The workshop’s final trick is the Warpstorm Doomrocket – miniaturised nukes that can be fired in battle. They take a while to land, so they’re difficult to aim, but they’ll kill more or less anything within a decent area of effect. All of this adds plenty of character, and has prompted many an evil cackle from me as souped-up Doom-flayers blend zombies into an undead smoothie, or a doomrocket deletes a horde of Saurus. 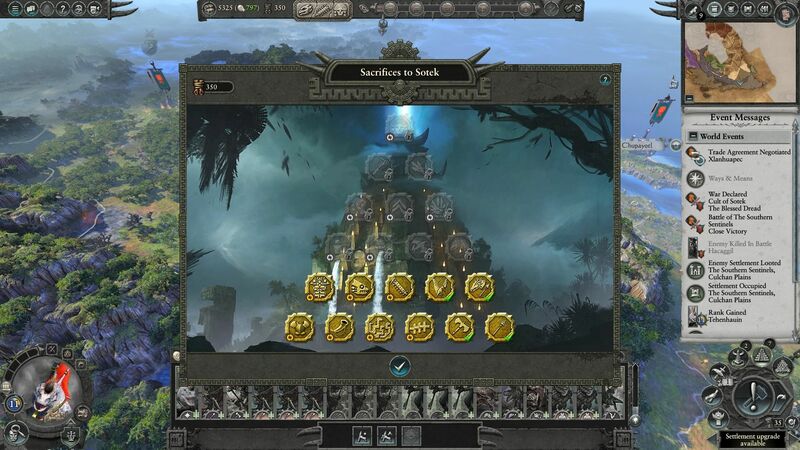 For dedicated Skaven fans this may well be enough, but for the rest of us, the workshop feels less impactful than Tehenhauin’s prophecy, or Alarielle and Hellebron’s mechanics in the previous Lord pack. It doesn’t radically change your strategy beyond nudging you to favour Skryre’s technological terrors in army composition – and not even then, if you’d rather embrace doomrockets. But then you have doomrockets, so, win/win. And it’s ok, because the Skaven are getting a truly transformative change in the under-empire. It isn’t technically part of the Prophet and Warlock at all; it’ll come as part of a free update that will accompany the DLC, so everyone gets to play with it. The only thing you won’t be able to do is build a warpstone-powered nuclear bomb under someone’s tier-five capital city and reduce it to a smouldering ruin – while imagining the sweet, salty taste of their tears – because only Ikit Claw’s under-cities can do that. And, to be fair, it’s not nothing. Because it’s free, I won’t discuss the under-empire any further in this review, but I love it so much that I’ve written a separate piece about it. You can check that out here, but the main takeaway is that it’s a brilliant addition that finally transforms the Skaven into their full, ratty selves. Even if you don’t fancy the DLC, you should jump back in and start a new campaign with one of the current Lords. Ikit’s initial challenge is hard, but not as hard as Tehenhauin’s, thanks to a strong starting army and neighbours who are reasonably easy to befriend – the ones who aren’t lizards, that is. There are also lots of trade resources in nearby cities, for which a scouting mission to Naggaroth found me plenty of customers. Since these Lord packs flesh out existing races rather than add new ones, they have to work doubly hard to freshen up the experience. Tehenhauin’s campaign is a great success in this regard – it might be my favourite from any Lord pack – while Ikit’s is a little less distinctive, and only felt so wonderfully fresh because of a feature that’s coming outside of the DLC. That’s as it should be, because it’d be a damn shame to lock something so fundamental to the Skaven as the under-empire behind a paywall. It’s cool that Creative Assembly didn’t do that. And it’s cool that Ikit Claw gets a workshop full of borderline OP mechanical murder machines, and nukes that can delete whole cities, as well as power armour with glowing warpstone effects. Who cares if he plays a bit like the other Skaven, just with more toys? Toys are fun. You like fun, don’t you? So The Prophet and the Warlock is a solid piece of DLC for the price. Tehenhauin scratches my itch for strategic challenge, while Ikit Claw offers some deliciously bonkers Skaven fan service that’s almost made me like the loathsome creatures. On top of this, the free update that accompanies this DLC is perhaps the most extensive that we’ve seen yet, and can’t help but engender a little goodwill (as a Bretonnia fan, I’m especially happy about their rework in Mortal Empires). Value for money is to some extent a subjective judgement, but in my view, this is a great deal for $8.99 (£6.99). That’s slightly more than Queen and Crone, but still less than two beers. Skip the pub on Friday and blow some stuff up. Its two campaigns offer deliciously bonkers fan service for the rats and a meaty strategic challenge for the lizards, deftly served with CA’s usual care for the source material. A generous free update that profoundly improves the Skaven is the icing on the cake.